Your home is where you and your family live, spending nearly 90% of our adult lives indoors*! Nearly every family has someone who suffers from issues aggravated by poor indoor air quality*. According to the EPA and the American Lung Association, indoor air can be up to ten times more polluted than outdoor air*. That’s because every home generates and traps millions of potentially harmful airborne particles, pathogens and gases that are constantly breathed and absorbed by everyone in the home. 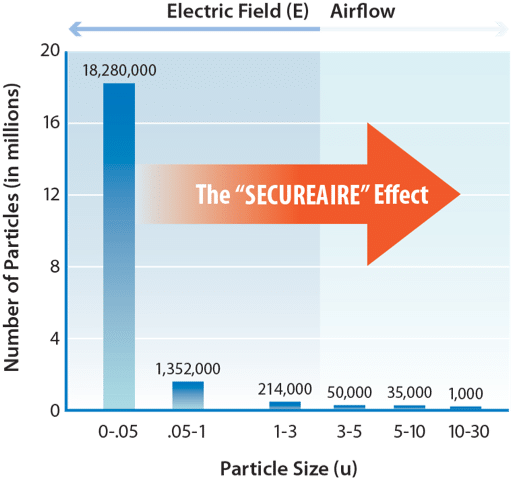 SecureAire’s ACTIVE Particle Control is the only technology that transports hazardous indoor air pollutants to be captured and INACTIVATED™ within the filter. The SecureAire Whole Home Air Purification System is extremely efficient and effective at providing the highest quality of indoor air possible today. Most airborne particles and gases in your home are invisible to the eye and are weightless, thus remaining suspended in the air. Even as air moves through your heating and cooling system, these potentially harmful particles including mold spores, bacteria, viruses, pollen, smoke and even airborne dust are NOT transported to the filters in your system. Standard filters are not active and cannot kill pathogens thereby allowing the continued breeding and potential release of these potentially harmful organisms into your home. Why a Whole-Home Air Cleaner? is professionally installed into your central heating and cooling system. This creates the ability to Transport hazardous indoor air pollutants from every room in your home to the SecureAire Filter. SecureAire’s ACTIVE Particle Control Technology has been proven in hospitals and LEED certified commercial buildings to exceed passive ltration strategies. It’s reliable and easy to maintain. Just replace the disposable filter when notified, typically every 12 months. Your family deserves Healthy, Clean, and Safe indoor air without a lot of work. Along with cleaning the air, SecureAire’s Whole Home Systems can save you money by keeping your heating and cooling equipment clean, maintaining maximum efficiency and thereby extending service life. SecureAire is backed by a 5-year product warranty and a 30 day Satisfaction Guarantee. Your family deserves todays most advanced indoor air purification system. through our exclusive SecureAire trained dealer network. Contact SecureAire through our CONTACT US form to find your local dealer.